LOS ANGELES — A US appeals court on Monday left in place a block on President Donald Trump’s travel ban targeting citizens from six Muslim majority nations -- the latest in a string of judicial blows for the controversial measure. 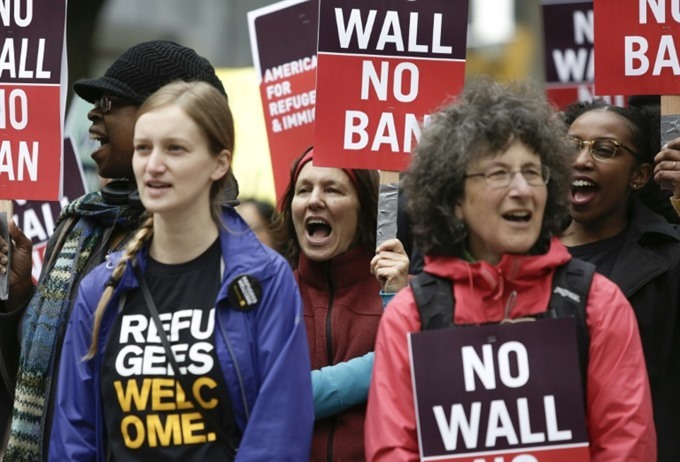 The decision came just ahead of a deadline for states challenging the ban to submit briefings before the US Supreme Court in response to the Trump administration’s request that the nine justices hear the case. The US Justice Department filed an emergency application to the Supreme Court on June 1, urging it to undo two lower court rulings blocking Trump’s decision to prevent entry to travelers from Iran, Libya, Somalia, Sudan, Syria and Yemen for 90 days. Trump’s executive order also temporarily puts a halt to America’s refugee program and reduces the number of refugees to be admitted this year to 50,000, instead of the 110,000 planned by the Obama administration. The Ninth Circuit Court of Appeals appeared to reject much of the administration’s arguments for reinstating the travel ban, notably relying on government reports to support its decision. Its ruling said that a report from the Department of Homeland Security issued just after Trump’s first executive order in March concluded that citizenship of any given country "is unlikely to be a reliable indicator of potential terrorist activity." Quoting the report, it added that citizens from the countries targeted by Trump’s ban are "rarely implicated in US-based terrorism." It also rejected the government’s assertion that Trump’s executive order -- which was revised after the initial one was struck down by the courts -- was not subject to judicial review. "Whatever deference we accord the president’s immigration and national security policy judgments does not preclude us from reviewing the policy at all," it added.